Your custom stationary awning, deck or patio awning is truly a reflection of your style, because you decide on the exact look of your awning from the fabric color and pattern to the size and shape that fits your personality and lifestyle. Stationary awnings, canvas patio awnings and deck awnings are made to withstand the weather elements in the Northeast all year round. Unlike Retractable Awnings, Stationary Awnings will provide cover for your patio and deck furnishings 24/7. This will allow you to enjoy comfortable outdoor living all summer long. Adding a stationary awning is truly like adding a covered open air room to your home. This added living space can be used for parties or just relaxing and enjoying nature while being protected from the sun’s harmful UV rays or that unexpected thunderstorm. Our custom-made stationary awnings are fabricated with SUNBRELLA high quality acrylic fabric. These awnings are made out of 1-inch square aluminum welded frames. You need not worry about the seasonal removal and re-installation each year, because these awnings are made withstand all the elements, year round. 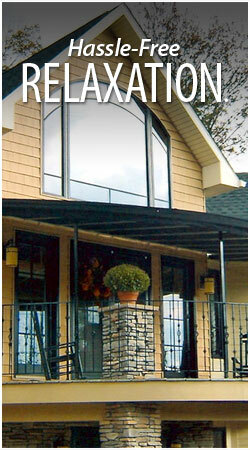 Click here for more information about our patio awnings.